After spending two nights in Lima and two nights in Cusco to acclimate, Chris and I were excited and ready to set off for the Sacred Valley and Lares Adventure with Mountain Lodges of Peru! The night before our adventure began, we met our awesome guide, Eddie, and seven other fellow trekkers for a briefing. At the meeting, we went through introductions (we ended up with a fantastic group of people! ), discussed logistics and packing, and went over the process for selecting the cultural activities and hikes. Over the next several posts I’m going to blog about each day that Chris and I experienced on the seven-day trek, so let’s get started! In the morning on Day One, the MLP van collected all of us at our respective hotels and then we hit the road leading out of Cusco. 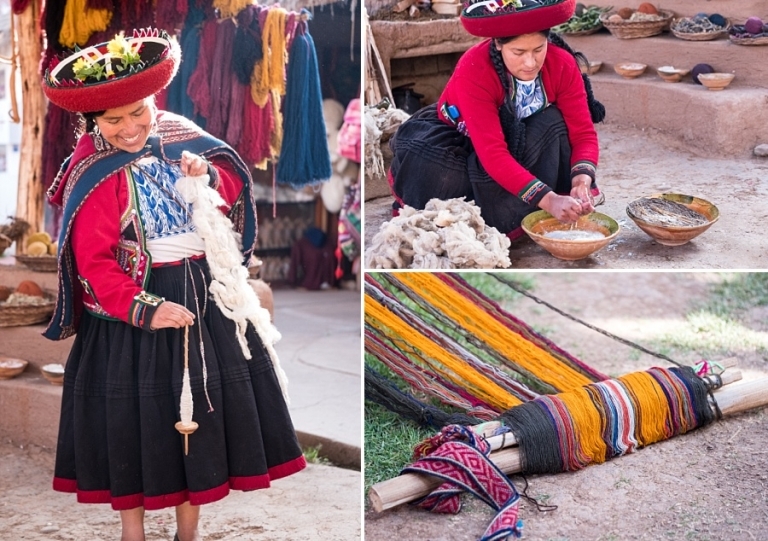 Our first cultural experience was a visit to a small village where we were treated to an in-depth weaving demonstration with information about the use of alpaca wool and the natural dyeing process. It was fascinating to see how they are able to get such vivid colors found in nature from plants, flowers, fruits, and minerals. One of the ladies even showed us how to get a bright red by smashing a beetle right in the palm of her hand (eek). And this was our first real opportunity to get up close to some alpacas since a few were penned up nearby. 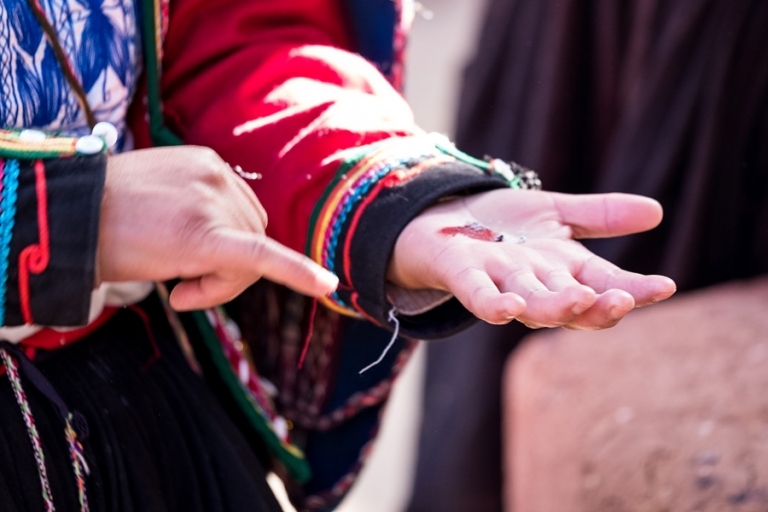 (Note: We ended up seeing hundreds of them all over the Sacred Valley throughout the seven days.) Look at those lashes and fuzzy noses! 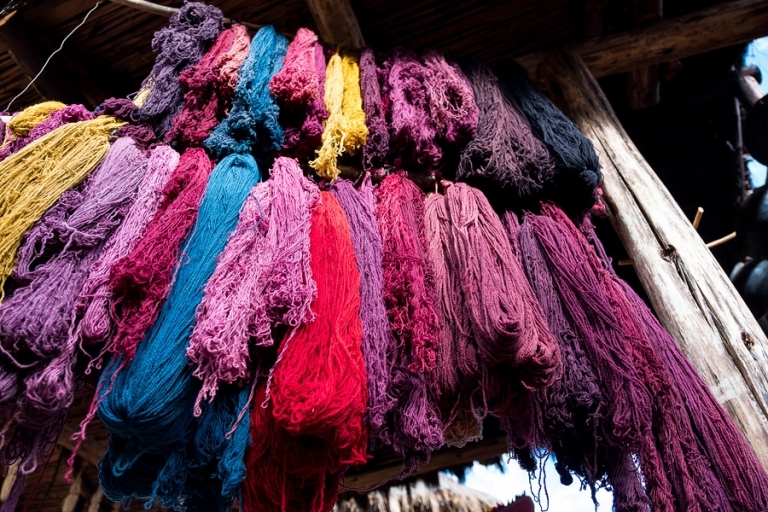 Their wool is considered to be a very high quality material in the Andean region for its softness and durability. 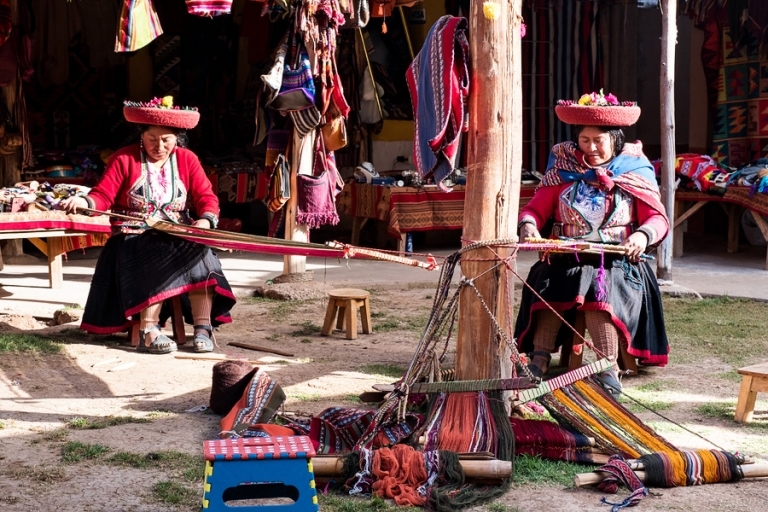 After the weaving demonstration we moved on to the archaeological site of Chinchero to continue learning about Andean life and to begin our foray into the history of the ancient Incan Empire. And this was where we started to realize what a treasure Eddie was – his guided tours were incredibly informative, funny, and passionate. I don’t think there was a single question about Peru to which he didn’t know the answer. He also asked all of us questions about our own home countries during our time together, and we could tell how much he genuinely cared about constantly learning and soaking up all kinds of world history, culture, and general information. Our assistant guide, Admil, was also so knowledgeable, sweet, and fun. We hit the guide jackpot for sure! At the archaeological site we visited a beautiful seventeenth century colonial church (no photos allowed inside) that was built right on top of an Incan structure. The walls built by Incas are easily recognizable by their technique of precision-fitted cuts and slight inward tilt, theorized to prevent earthquake damage. So smart! Eddie also introduced us to the ancient technique of dehydrating potatoes which is done out in a sunny field like the one shown below. Once dehydrated, the potatoes can last for years to be used in soups and stews. After the guided tour of Chinchero, our group split up into two smaller groups for two different hikes. Half of the group set off on foot to hike down from Chinchero. Chris and I boarded the bus for the hike that would include a visit to the Moray archaeological site and then the Maras salt ponds. The salt ponds were one of the main reasons we selected the seven-day Lares Adventure vs. the five-day itinerary, so obviously we couldn’t pass that up! 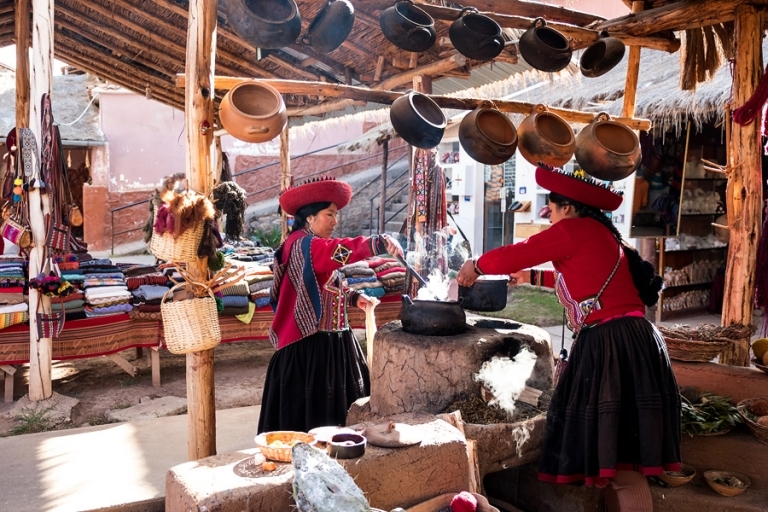 We passed through more villages along our route, and all the while my face was pressed up against the bus window soaking up details of the fascinating Andean lifestyle. At Moray we discovered stunning visual evidence of Incan agricultural experiments, which totally blew my mind. They went to so much trouble building this intricate terraced site to experiment with farming techniques, and I find it challenging just to keep a houseplant alive. I would have made a terrible Inca. We ate lunch in the town of Maras before arriving at the salt ponds for one of the coolest hikes I’ve ever done. Our walk began at the visitor center and continued along the edges of the salt ponds. The terraced formation and salt mining process dates back to pre-Incan times, and we learned about the tasks that are still performed today using that same pre-Incan structure. As we walked along the narrow salty ridges deep into the mines, the tourist crowd (well, other tourists that is) thinned out and the site became more peaceful as we were left with only our small group guided by Eddie. He explained that the salty water source (which we tasted!) comes from a subterranean stream which pours over the terraces, filling the ponds. As the sun shines down along the cliffs, the water evaporates and the salt remains. We observed families working in their ponds harvesting the salt crystals. Mmm, salty. The hike continued along the entire length of the salt mines and then a few miles down a dusty trail into the valley along the Urubamba river. Our Maras visit was my favorite part of the day and one of my most favorite hikes ever. I had never seen anything like it! It helped that we were gifted with absolutely gorgeous weather, too. Both groups met back up in the evening at the incredible Lamay Lodge where we ooh’ed and ahh’ed over our accommodations (complete with resident llama), enjoyed the hot tub, ate dinner, and attended our next briefing. I wish I had taken the time to photograph our lovely meal prepared by the brilliant chefs at the lodge, but we were ravenous after our big day (despite eating nearly that entire mini fruit basket as a snack) and I didn’t pause for even one snap. So that’s it for Day One! Next up, a visit to the community of Viacha and the archaeological site of Pisaq on Day Two. Susan - Thank you so much, Adrienne! Yes, those salt ponds were such a special place!